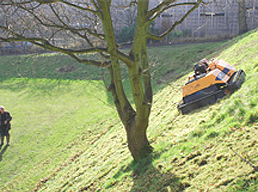 Remote operator controlled for difficult and steep areas. 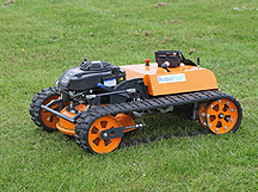 Developed in conjunction with a tracked vehicle specialist, the RoboFlail has proved very successful in the market place. 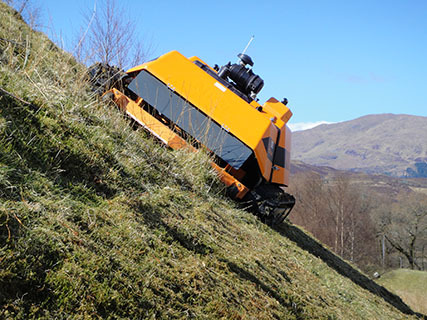 Operable up to 45 degrees on banks, the machine comes with the option of two types of deck to suit the area. 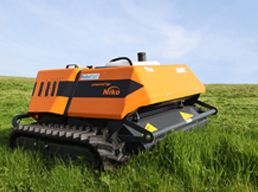 The operator uses an easily portable control module, and can be up to 300 metres distant. There is the added benefit of removal of hand-arm vibration issues. Added to the RoboFlail is the RoboVario. 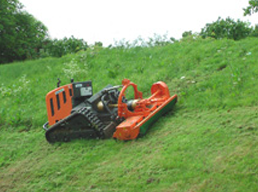 This features an out-front category 1 three point linkage assembly, so that existing attachments such as post-hole augers, snow or dozer blades, stump grinders or snow blowers can be fitted, to allow vital work on areas otherwise deemed inaccessible.